It is the Lenten season now for our Christian readers. A little over six weeks for prayer, penance, self-denial, etc. So you may ask, why are we looking at Lent? Well, two reasons actually, the first is that religion has played a significant and gigantic role in beer culture; the second is that Lent has spurred the creation of some amazing brews. Even more so than politics, beer and religion have a long intertwined relationship. Once again we have to go back to the reason beer has been ever present in human civilization. It wasn’t until recently in human history that we have had safe, reliable drinking water. There are still substantial parts of the world where this is still not the case. The beer making process though does make beer a reliable and safe alternative. This fact was not lost on early humankind and beer quickly established itself as a beverage of choice with brewing being a noble and religious endeavor. Archeology has backed this up over the years with discoveries of the beer-religion connection in many early civilizations. Let’s skip forward a couple of thousand years until we get to the monastic movement. Christian monks were supposed to live a life of asceticism, away from the secular, focused on the spiritual. They were also to be self-sustaining with all hands working for the benefit of the monastic community. With water still being an issue the monks brewed beer. Fasting was a major component of Lent and the monks took it seriously, but there was still work to be done. This is Latin, “liquida nonfrangunt ieuniu” and it basically means that liquids do not break the fast. In this saying though lay the solution to the problem the monks faced. Make a high calorie liquid to give them the energy needed to get through their days. The easiest way to do this was to amp up the beer they were already brewing. Enter doppelbock beers, also known as liquid bread. In an interesting bit of irony (maybe), the monks sent a cask of their brew to the Pope in Rome for his approval that they could drink this beer during Lent. The beer skunked in route, when it was tested by the Church leaders the beer was so sour and nasty that they assumed it was additional penance and hardship and were only too willing to allow the monks to drink the beer they were brewing as an added sacrifice. Skunked beer saved the day on that occasion and we continue to enjoy delicious doppelbocks. So how effective was the beer? Last year, J. Wilson, an Iowan, did 46 days of fasting living on just doppelbock and water. He drank an average of 4 to 5 pints throughout his day. He lost weight, but still had plenty of energy to do the work needed to be done. In his case brew beer actually. Each beer had 250+ calories. 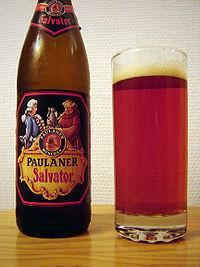 If you want to enjoy a couple of beers for your Lenten season I would recommend going German. The list below should prove useful. If you decide you want to fast for an extended period of time and drink only beer, well our advice is to please check with your doctor first.